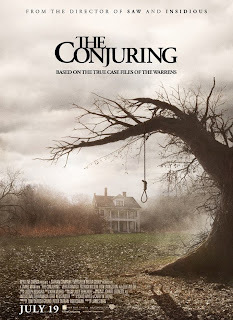 The plot of THE CONJURING is a familiar one: Roger and Carolyn Perron (Ron Livingston and Lili Taylor) buy what they believe to be their dream home and along with their five daughters (Mackenzie Foy, Joey King, Hayley McFarland, Shanley Caswell, and Kyla Deaver) move in. Almost immediately strange things start to happen. At first it's nothing major, but over time the intensity and maliciousness of the occurrences grow until the family is scared enough to call in paranormal investigators Ed and Lorraine Warren (Patrick Wilson and Vera Farmiga). After being convinced of the legitimacy of the Perron's claims, the Warrens then set about trying to get the evil spirits to leave, but that proves easier said than done. So yeah, it's pretty much the same basic ground trod by POLTERGEIST, THE AMITYVILLE HORROR, A HAUNTING IN CONNECTICUIT, and many others. THE CONJURING may not earn a whole lot of points for originality, but it does deliver where it counts, in the scares department. The whole “based on a true story” shtick is even more dubious here than usual, the alleged events providing the basis for the film hardly qualifying as verifiable fact to begin with, and having been further altered and juiced up for the big screen. Ah, but who cares? My inner skeptic may grumble a bit, but my inner horror fan was having too good a time to listen to his complaints. If nothing else, the film's ties to reality (however tenuous) may be the reason it avoids the sort of ridiculousness director James Wan's previous spookfest INSIDUOUS descended into during its third act. In fact by modern movie standards THE CONJURING is almost reserved. It builds slowly, letting the tension and suspense mount, and even during the climax doesn't overdo it with the special effects and arbitrarily busy action. I wouldn't say any of the cast gives a “great” performance, but they all at least get to create actual characters. On the downside, the decision to focus equally on the Warren's and the Perrons from the very beginning, cutting back and forth between the two families even before they've met, undercuts some of the mounting dread that would have been created by just sticking with the haunted house story until the Perron's go seeking help. From that point onward, however, the movie flows pretty well. On a more minor scale, but nonetheless still a gripe, the use of The Zombies' “Time of the Season” in a “moving in” montage and Dead Man's Bones “In the Room Where You Sleep” during a “setting up the equipment” montage feels somewhat jarring in a film that otherwise doesn't make use of pop music. Both good songs, mind you, they just don't really feel like they belong. For the most part, though, THE CONJURING is just good spooky fun. 3 out of 4 stars.